Educated at Harrow, he joined the army as a cornet in January 1800, serving in the 10th Light Dragoons. He was promoted lieutenant in June 1800 and Captain on 20 August 1803. He exchanged to the 60th Regiment of Foot in April 1806 and served on the staff of the Duke of Bedford, then Lord Lieutenant of Ireland. 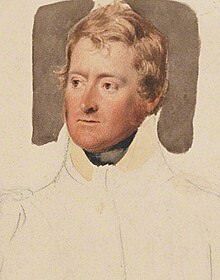 Promoted major on 25 June 1807, he went into the 23rd Light Dragoons on 6 August 1809 and went with them to serve in the Peninsular War. He fought well at Talavera. He was promoted lieutenant colonel on 15 March 1810, and served as assistant adjutant-general at Buçaco and Barrosa, directing a successful charge by a squadron of the 2nd Regiment of Hussars (KGL) against the French dragoons. He was given command of the 12th Light Dragoons on 11 June 1811. After the fall of Badajoz, he distinguished himself in the battle of Villagarcia (or Llerena) on 11 April 1812, temporarily commanding Anson’s brigade. Ordered by Sir Stapleton Cotton to detain a superior force of French cavalry under Charles Lallemand, he successfully delayed them until reinforcements could arrive to flank the French and pursue them into Llerena. He led the 12th Light Dragoons to disperse some of the broken French infantry after the Battle of Salamanca, and was wounded while covering the withdrawal from Burgos. At Vitoria, his regiment was part of the force, under Sir Thomas Graham, that blocked the French retreat towards Bayonne. He took part in the Battle of the Pyrenees and the fighting that followed in the south of France, bringing to Wellington the news that Napoleon had abdicated. During the Waterloo Campaign, the 12th Light Dragoons were attached to Sir John Ormsby Vandeleur’s light cavalry brigade. At the Battle of Waterloo, the 12th and 16th Light Dragoons were told to charge down the slope, but no further, to support the withdrawal of the Union Brigade of heavy cavalry. But, like the Union Brigade (led by his second cousin, William Ponsonby), the light horse charged (as he later admitted) too far. Ponsonby was wounded in both arms, and knocked off his horse by another sabre cut. A French lancer saw him move where he lay and stabbed him in the back with his lance, exclaiming “Tu n’es pas mort, coquin” (You’re not dead, you rascal). A French skirmisher then robbed him but luckily for Ponsonby, a Major de Laussat of the French Imperial Guard Dragoons found him and treated him kindly, giving him some brandy and promising to send help should the French prove victorious. Later, another French skirmisher used Ponsonby as a shield as he talked with him and fired over his body. Toward the end of the battle, he was ridden over by Prussian cavalry. During the night after the battle, he was roughed up by a Prussian looking for plunder, and a mortally wounded soldier of the Royal Dragoons had crawled upon Ponsonby’s legs and lay dying. At last, Ponsonby was discovered by a soldier of the 40th Foot, who stood guard over him during the night. The next morning he was carried away in a cart, to a surgeon who tended to his seven major wounds. Despite his wounds, he was bled of 120 imperial fluid ounces (3.4 l) over two days but nevertheless survived. He convalesced under the supervision of his sister Lady Caroline Lamb who nursed him back to health. Plinth of Ponsonby’s Column, a monumental column erected in Valletta in 1838. The column was destroyed by lightning in 1864, and only the plinth survives today. Ponsonby went on half-pay on 26 August 1820, and was appointed “inspecting field officer” in the Ionian Islands on 20 January 1824. On 27 May 1825, he was promoted major-general, commanding the troops in the Ionian Islands. 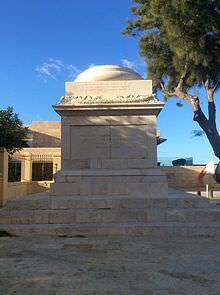 The next year, on 22 December 1826, he was appointed Governor of Malta, and remained there for eight and a half years. He met Baron de Laussat, his saviour at Waterloo, in 1827. During his Maltese tenure, he was made GCMG in 1828, and KCB and KCH in 1831. He left the governorship in May 1835 (but remained the de jure Governor until 30 September 1836), and was appointed colonel of the 86th Regiment of Foot on 4 December 1835. He was transferred to the colonelcy of the Royal Dragoons on 31 March 1836. During this period, he maintained a high degree of interest in the handling of cavalry, and corresponded with Wellington. He died suddenly at an inn near Basingstoke on 11 January 1837 and was buried in the crypt of St Nicholas’ Church, Hatherop, Gloucestershire.